Some 28 schools across the country have been conferred International School Award [ISA] under connecting classrooms program of British Council for their outstanding performances in the academic year of 2016-2017. 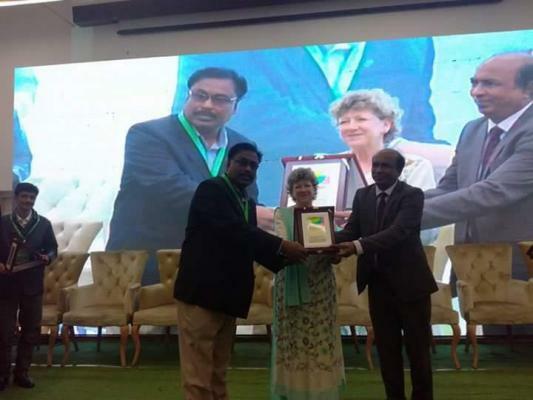 Secretary, Ministry of Education, Mohammad Sohorab Hossain attended as chief guest with Director British Council, Bangladesh, Barbara Wickham in the chair. Director British Council, Bangladesh, Barbara Wickham in her welcome speech said, ISA is a celebration and recognition of collaborative activities of schools. International School Award [ISA] practice under the Connecting Classroom program is very important and essential to develop global teaching- learning trend among the teachers and students. It is a partnership journey between schools at home or abroad which develops networking and sharing the curriculum, extra-curriculum activities of schools and exchanging cultural values, tradition and heritage. She also said, around 4000 schools of the country were registered with Connecting Classroom program of British Council Bangladesh. The organization offers face to face training and on-line courses for the teachers on different educational programs including 21st century core skills to improve professional skills and to ensure sustainable teaching learning. Connecting Classroom program is very effective and sustainable to reach the target. Teachers and students benefit by sharing best practice working on joint educational projects dealing with global issue, he added. Later a round open discussion styled Education for a changing world round table discussion was held. Educationist Government officials, policy makers, Experts, teachers and leaders joined the session. Speakers underscored the need for motivation, change of mindset, dedication and sincerity to ensure world class teaching learning environment in and around the classroom. Connecting Classroom program is also best way to equip the children and youth to face the challenges of the days ahead. Around 100 teachers including principal, head teachers, education officials, policy makers, experts across the country joined the event. Later a cultural program, performed by the students of Viqarunnisa Noon School & College was held.